The ‘Jeonju-Daesaseup play’ is a historical traditional Korean music contest which first started during the Joseun Dynasty. The contest was discontinued when Japan occupied Korea but was revived in 1975. Since 1975, it has been held every year in Jeonju. 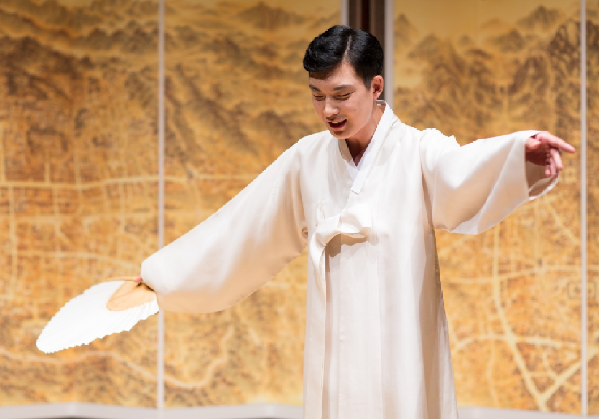 Jeong Yoon-hyung a Hanyang University (HYU) junior, who majors in Korean traditional music, won first prize of the Pansori competition in the 43rd Jeonju-Daesaseup play that was held on September 8th through the 11th. Q. Do you have any special criteria when selecting a song for the contest? A. I usually choose a song with my teacher, Yoon Jin-chul. But for this contest, I choose the song myself. Although my teacher opposed of my choice I could not give up because the more I sang, the more I had the feeling that I needed to pursue this song. Q. What is your favorite Pansori song? A. The Chunhyangga’s parting scene is my favorite part. I deeply identify with the Chunhyang and am always impressed by the depth of her feelings she has in that particular scene. Especially in the Boseong Pansori when Chunhyang is sending her lover away, she just watches him leave from afar. In that scene the lyrics are so beautiful that every time I sing that part, tears come out of my eye. Q. When did you start to learn Pansori? A. I was just 2 years old when I had my first experience with Korean traditional music through the ‘Jeonju-Daesaseup play'. I instantly fell in love with the sound of traditional Korean music. My parents took me to the Yoon Jin-chul; a pansori teacher when I was 3, but he refused to teach me because I was too young. (I could barely speak.) One year later, (after I started to learn how to speak), I started Pansori with him. I have been doing Pansori ever since. Q. What attracts you to Pansori? A. I have a lot of fun while singing because I play various roles. In Pansori, the singer is required to play all he characters that are introduced in the song. I enjoy conveying joy, anger, sorrow and pleasure that all of these characters have. Q. Do you have a role model that you look up to? A. My role model is my teacher’s teacher, Jeong Kwon-jin. I never had the chance to meet him since he died in 1986, but I heard great stories about him through my current teacher. He always puts an emphasis on having a sound mind because good music comes from a sound mind. I want to be a traditional pansori singer who is not only good at singing traditional songs, but who also has a great personality and sound mind. Q. Do you have any upcoming contest that you are looking forward to competing in? Q. What kind of Pansori singer do you want to become? A. I want to be a singer who makes sings a genuine song and not a fake one. Also, I want to be the type of singer that makes songs that can be sung by everyone.